Eltima SWF to FLA Converter for Mac OS is the only Flash software on the net for Mac OS users, that lets Flash designers convert SWF files back into FLA format in a few mouse clicks. It presents user with an arsenal of profound algorithms to extract all Flash objects from SWF file. Extracted objects can be edited in native Flash environment, which is very convenient when working with Flash. Every group of objects such as morphs, shapes, texts, fonts, motions, sounds, ActionScripts, etc. could be placed in separate FLA library groups, which makes it easier to use and view the resulting FLA file. Every FLA library can be saved into a different folder under a specified name. Additionally, you can customize FLA file workspace by enabling/disabling guides, grids, rulers; specify guides accuracy and so on. To make sure that masks layers are working properly, every morph or shape can be placed on different layers. Forgotten passwords to your SWF file are not a problem any longer with SWF to FLA Converter. While decompiling SWF file resources the application bypasses this protection mechanism. Once you have converted your SWF into FLA you can set new protection in your favorite Flash editor. 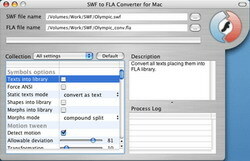 SWF to FLA Converter is the only Mac OS tool to export the whole SWF movie in FLA format that supports Flash MX and ActionScript 2.0. Restore your lost original FLA files from available SWF files using Eltima\'s SWF to FLA Converter for Mac, thus saving you time and efforts to develop or modify your Flash movies. You can easily change Flash objects, modify text or hyperlink, replace sounds, images, etc. and convert it back to SWF file.